Class VII myosins are among the most widely expressed myosins in the animal kingdom. They also have a broad tissue expression. Vertebrates and some invertebrates possess two different myosins VII, myosin VIIa and myosin VIIb, which may differ in their kinetic properties. Defects in myosin VIIa cause phenotypic anomalies in Drosophila, zebrafish, mouse and humans. In humans, loss-of-function mutations in the myosin VIIa gene cause Usher syndrome type I, a dual sensory defect that combines sensorineural deafness and retinitis pigmentosa leading to blindness. Some progress has been made in the characterization of the enzymatic properties of the myosin VII head domain, leading to the view that myosin VIIa may both exert tension at given subcellular emplacements, and move cargos (molecules or organelles) along actin filaments. 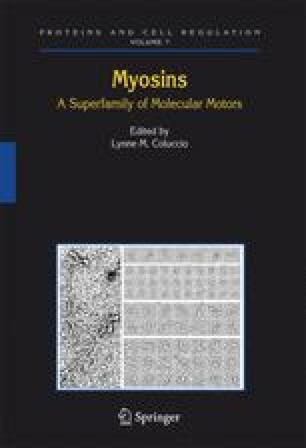 The formation of myosin VII dimers in vivo, however, remains to be shown. Based on the analysis of mutant phenotypes and the deciphering of myosin VIIa-associated molecular networks, some of the roles played by myosin VIIa in the developing inner ear and the retina have been elucidated. In the inner ear sensory cells, myosin VIIa probably acts as a conveyer of several Usher syndrome proteins that are involved in the differentiation of the hair bundle, the structure receptive to sound or acceleration. In the retina, myosin VIIa transports melanosomes and phagosomes in pigment epithelium cells, and opsins in photoreceptor cells.